The Eye in the Logo Means they are Watching You! It looks like I better be careful. They might be getting ready to shut me down. It is happening all over China. Rules took effect recently that create a censorship point system in order to curtail any offensive content on social media sites in China. Now, we are not talking about Facebook and Twitter. Both are banned in China. In addition, the government has and utilizes the power to shut down internet access, cell phone access and satellite TV access anytime it sees fit. For example, the government decided that the anniversary of the terrible earthquake that happened a few year ago, but be honored by not allowing English channels to broadcast for several days. China provides it’s citizens their own social media networks. 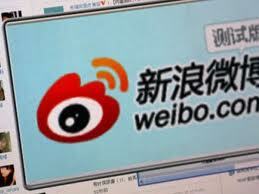 One of the most popular mini blog sites, which is similar to Twitter is Sina Weibo. And over 300 million users post and comment on Weibo every day. Each Weibo user receives a user contract with a starting score of 80 points. For every bit of content posted your score can go up or down depending on the nature of your content. Over 100 points, you are golden. Drop below 60, you are in trouble. Loose all your points, no more access for you. Who decideds who stays and goes? It has everything to do with the content. I image a room like this with a 1,00o computer terminals and shifts working all day and night to rid the internet of objectionable content. It probably feels like a sales call center. These men and women probably have quotas and get bonuses for banning people from Weibo. Ban a user, ring a bell and you get a little extra in your check that week. Offensive Content: Serving McDonald Big Macs at a Appreciation Party. That offended me. Content that spread rumors: Is it a rumor, if it is true? I am sorry, but Crazy stuff happens in China. Content that called for a protest: I thought is was my duty to protest against people taking off their clothes at a public resort pool. Especially if that person is my employee. There were children present. Content that promotes cults or supersitions: Chinaism, is not a cult, it is a way of life. And finally, content that impunges the Chinese honor: Well hell, that is my whole blog. I have written a lot of post on China. And as you can see, I have violated a few of these rules myself. But, since I have an app that makes my computer looks like it is in California and I don’t believe those crime shows that show the cops can pinpoint a persons location from their IP address, I think I am safe for now. Btw, I have had the most technical difficulties in writing this post then any other. They might be on to me already. Censorship on that level is crazy – and wrong. I stand by what I write. Then again, I don’t write anything controversial. You teasing a Blog Fest in September, but not sharing the subject until August is controversial. HAHA. Thanks for the comment Alex and give me a hint, I promise, I won’t tell. If we grew up in that culture, we would think it is normal. Your post certainly raises an interesting question about censorship…. Thanks for the comment Maryellen. Running a business in China, I have the opportunity to hire and get to know several local Chinese people. They are all in their 20’s and 30’s and they all have an issue with it. The more they are exposed to western culture and the exodus from villages to the cities is making them more aware of what other’s have. China is not like North Korea. They have a hint at what it going on in the world and certainly want more access. It is pretty interesting stuff. That kind of censorship is just wrong. It can’tpossibly be justified on any basis thantrying to keep the people crushed beneath the heel of the proverbial boot (or not so proverbial in this case…). I stand by my content, but I don’t think I’ve written anything worth dying for. But, if I HAD something to say that WAS worth dying for, I’d like to think I’d say it. I agree Ciara. It is wrong on so many levels. I think that because there are so many people in China, they go to the extremes of everything to protect the government. I don’t thing much of what I write will cause an uprising, but it is an interesting questions. Thanks for the comment and the retweets. I appreciate it.